At the centre of the town of Chudleigh at the junction of New Exeter Street [Culver Lane], Old Exeter Street [Exeter Way], Clifford Street [Mill Lane] and Fore Street in the open space called The Square [Conduit Square] stands an obelisk of granite. Its site is roughly that of the original market place and its market house which was destroyed on 22 May 1807 in what subsequently became referred to as 'The Great Fire of Chudleigh'. A market cross also stood close by, but this was subsequently lost and no record survives to reveal its fate following the fire. The substantial obelisk, having a quadrangular tapering granite shaft with a pyramidal apex sits on a moulded two-tier plinth which in turn is located on the top of a 4ft high rectangular base, the whole structure measuring 18ft in height and estimated to weigh at least twenty tons. Looking at the obelisk it is apparent that the granite from which the base is made differs from that of the obelisk itself. It has been suggested that the granite obelisk came from elsewhere and when a replacement for the ageing town pump was considered the rectangular base (actually two halves almost seamlessly abutted on the vertical) was designed to give the appearance that the whole was designed at the same time. However in all probability the structure was built as a whole as there are similar structures existing in market towns elsewhere, such as Warminster, Wiltshire. The base is likely partially hollow to admit the water pipes and give access to those who needed to service the internal workings. 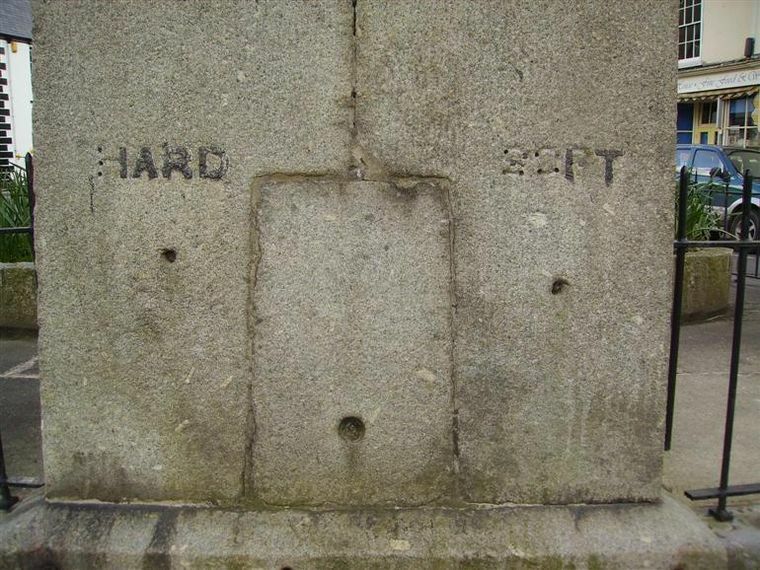 Serving the town as a water conduit from at least 1837 to the 1920s, the words 'HARD' and 'SOFT' remain, in lettering of what appear to be of lead inset into the granite low down on the north side of the rectangular base. This style of lettering probably dates, at the earliest, to about 1909/10. Note that a postcard photograph of 1901 does not show the lettering. The two sources of water would have come from the Haldon springs (hard water) and rainwater (soft water). Morley Plaque 21" x 15"
The Pot Water and Water Supply pages give a fuller history and routes of Chudleigh's water sources. The origin of the original town conduit/pump can only be guessed at but records show that there were repairs being carried out to the brass bearings on the pump by one John Bailey as early as 1561. The pump stood over an ancient well in the Square which was stated to 'provide an excellent quality mineral spring water'. The Court Leet presentments book from the early 18th century reports criticism of the Lord of the Manor for the town pump being out of repair. In 1777 the churchwarden's accounts record that '1s was paid for leather for the town pump and a further 1s was paid for a lock for the town pump'. Following the Chudleigh fire (22 May 1807) the town was said to have been fully rebuilt by 1811. Part of the town improvement scheme was to sweep away the old straggling market house buildings from the central area and to mark the 'rebirth' of the town. It has been suggested the obelisk could well have been erected at that time. This at first seems logical but the date does not tally when taking account of Mary Jones' History of Chudleigh (published 1852) in which she remarks of the 'granite pillar of recent erection'. The new market house and yard was rebuilt in Exeter Way, on the site now occupied by the Town Hall. In 1819 six shillings was paid for a new lock and key for the pump and in 1824 the pump mechanism required further repair when 4s were paid out by the churchwardens. The Churchwardens Accounts for the years 1826–1838 are missing. It is probable that these records would contain the answer as to the inhabitant who provided Chudleigh with its obelisk. The Mid Devon Advertiser, in an article written in 1897 suggests that the 'obelisk was given by an inhabitant more than 60 years ago' (i.e. some time in the mid-1830s). 1832. Severe cholera outbreaks in Exeter and Plymouth. 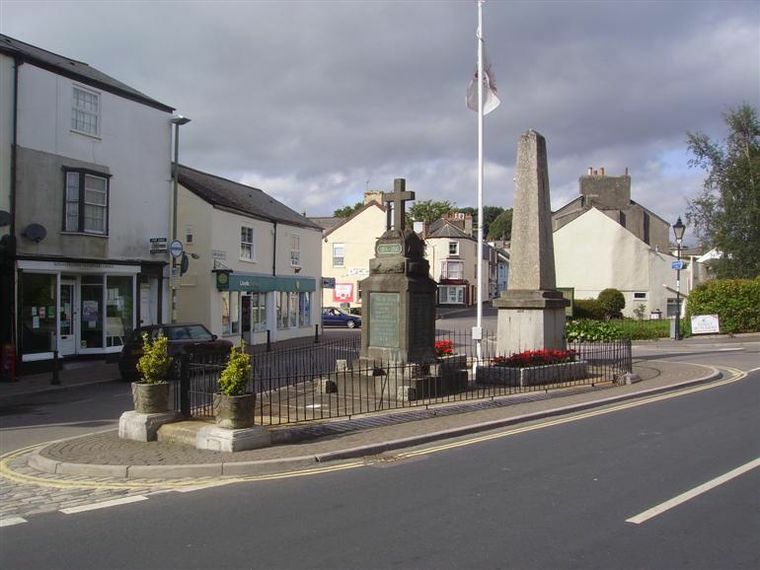 Chudleigh is in a limestone area, so how would a granite obelisk come to be placed in the town? This may be explained by the fact that one of the members of the local relief committee set up immediately following the fire in 1807 was Rev. John Templer (1751–1832) of Lindridge, Kingsteignton whose brother, James Templer (1748–1813) of Stover had the granite quarrying rights at Haytor. Rev. John Templer was a significant landowner in Chudleigh and to mark the rebuilding may well have gifted the obelisk to the parish via his brother James. Note that Rev. John Templer died in 1832 which is too early a date to really be a viable option, unless it was perhaps a bequest in his will. James Templer (1748–1813) of Stover House left all his business interests to his son, George Templer (1783–1843) including the granite quarrying rights at Haytor. It was George Templer who, in the early 1820's, received the commission to supply Haytor granite for the construction of London Bridge. He lived at Stover House, Teigngrace until he sold it to the Duke of Somerset in 1829. He then removed to 'Whitehill House' at Highweek and in about 1836 to Sandford Orleigh a house he had built on the western outskirts of Newton Abbot. It was here he died on 12 December 1843 following a riding accident. So it was that he was never a Chudleigh inhabitant as such but he did have various business connections with the town. He was a local landowner and in 1841 was one of the five trustees of the advowson of Chudleigh (the right of presenting a clergyman to a C of E living). He is probably was approached at some time in the mid to late 1830s to have the stone quarried and the obelisk constructed and installed. But who was the benefactor? There is a very early photograph of the obelisk, (taken for Robert Crook, printer and stationer [established 1839] of Fore Street and proprietor of the Weekly Express newspaper, from 1855) which dates to about 1850/55. (Daguerrotype photography invented 1839, Fox-Talbot 1841) The obelisk looks to have been in place for at least a few years by the time the photograph was taken and this surviving visual image helps to put its erection date in the period 1937–1847. There is an advertisement affixed to the south side for a Marine Store and a small gutter can be seen at the base which would presumably be evident on all four sides. Cart stones are located at each corner. A hand operated pump stands against the south side; this is a reciprocating pump of that type would have been capable of drawing water from a well of up to thirty-two feet in depth. Two women crouch in front of the obelisk and appear to be collecting water from its west side. Although the top half of the obelisk is not shown there is no obvious sign of the oil lamps that were present by 1857. The photographer would have been standing at a position outide the present-day vet's, facing east; the three-storey building in the background was The Ship Inn and to the left, the entrance to Mill Lane (later Clifford Street). "The Conduit, Chudleigh. Taken about 70 years ago"
which would seem to imply that the photo dates to about 1855/60. The town pump, as before described, was replaced by a new conduit to which was incorporated the granite obelisk. It is not a particularly unusual structure when comparing it with surviving conduits that have survived in other towns. It was probably only ever intended to be a water collecting point (albeit rather striking), rather than as a marker of some important event. 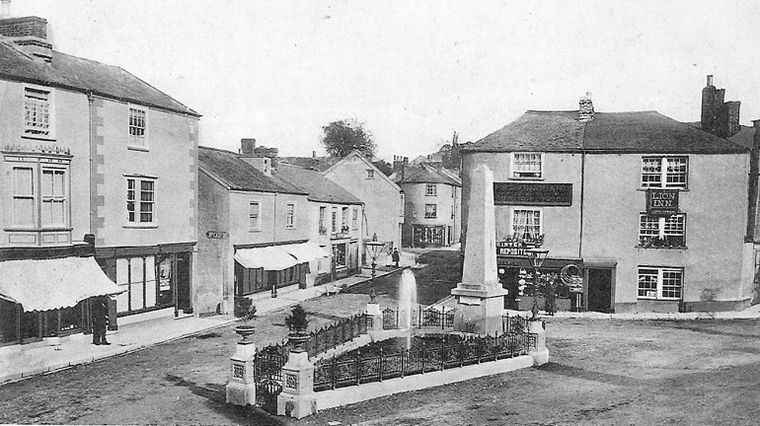 Mary Jones, a Chudleigh resident and author of A History of Chudleigh published in June 1852 mentions the obelisk thus: 'In the centre of the town there is a triangular space where the old market-house stood; now there is a granite pillar of recent erection to which are attached a pump and conduit'. As she makes no mention of the reason for its erection, it would seem that its purpose may have been jusr an elaborate housing for the town pump and conduit. Exeter and Plymouth had suffered from cholera in 1832 and parts of England suffered a second major outbreak of cholera in 1849 and although its effects in Chudleigh at that latter time are not known it is probable that as a result of improving the town's access to its water supply the pump/conduit and obelisk was erected at about that time. Chudleigh always had the benefit of two sources of water, one being the Pot Water. The above description suggests that the Pot Water was diverted to flow through the conduit which seems unlikely. 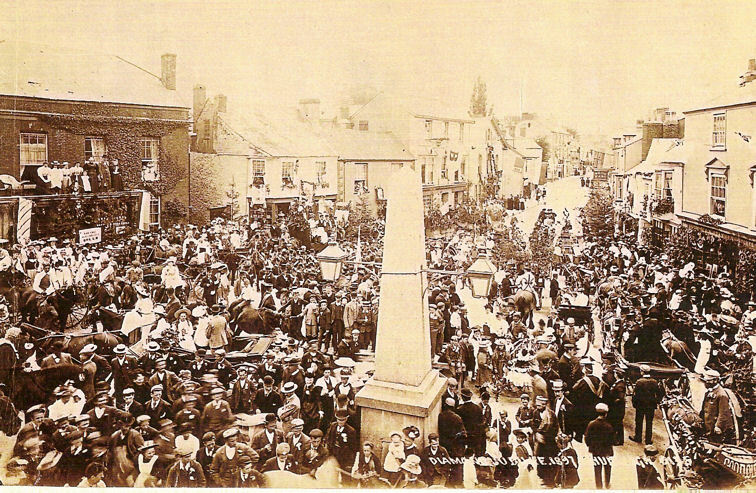 In late 1855 newspaper items indicate that the obelisk had two oil-fired lamps attached to it, these were described by one visitor to Chudleigh as 'doleful' and went on to accuse the lamplighter of neglecting his duties. The oil lamps were replaced by gas in 1870 but were almost as ineffective as their predecessors and they were removed about 1898. 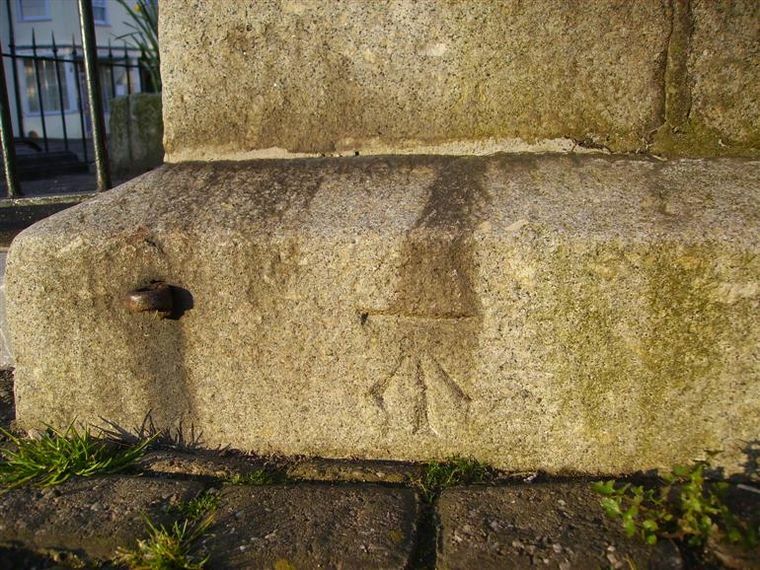 The iron brackets on which the lamps hung have long gone but 3 stubs still remain embedded in the granite on the east and south faces. There is also a vertical hole drilled through the moulded plinth on the east side, this would have been the hole through which the gas pipe passed. 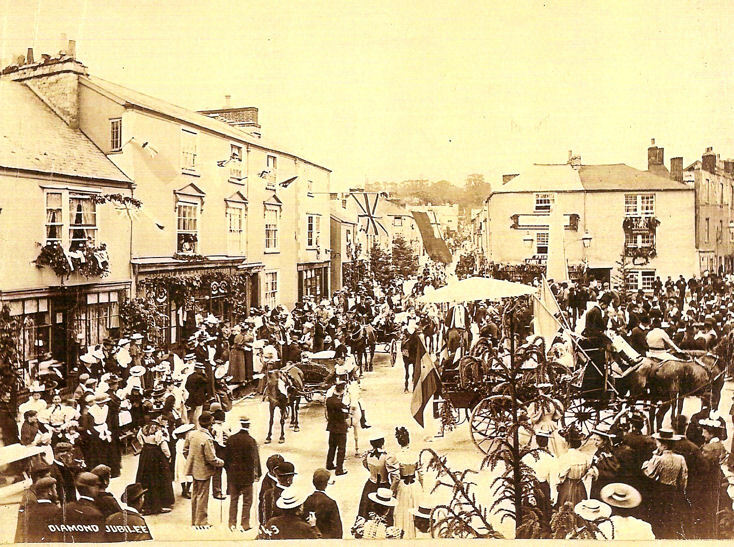 In 1875 Mary Jones published a revised edition of her history and said; 'Chudleigh consists of a principal street about half a mile in length. In the centre of the town is a vacant space where the Market House formerly stood, now supplied by a granite column'. Does this indicate the column was intended to mark the location of the original market house burnt down in 1807?. Possibly yes; the reason for the obelisk at Warminster was to replace the original market cross and mark the site of the ancient market place. The inscription is a little misleading as it first appears the supply was inaugurated in 1879 which is not the case. In fact by then the supply was already some 200–300 years old. Major improvements were called for to the town's water supply by 1879 and the Dowager Countess' involvement was to give her consent for additional water to be provided from the spring on the Whiteway estate. Evidence for the 1879 water supply improvements can be gleaned from various items which appeared in the Devon Weekly Express. By late 1878 it was recognised that the drinking water supply to the town was of a poor quality and tenders were put out for the piping of the leat from Kennel Spring to the reservoir and also for covering over the reservoir to prevent the admission of debris. The local health committee made an application to the Dowager Countess, on whose land the spring was situated, and she kindly consented to grant 20,000 gallons of water per day for the Chudleigh town supply. Of note dating from this period is the benchmark (see explanatory footnote at end of this article) carved on the lower north-east corner of the base, this was likely made about 1887 when surveying was carried out for the 1 inch scale second edition Ordnance Survey map. The map covering the Chudleigh area was published in 1891. Two postcard photographs survive dating from the Diamond Jubilee of Queen Victoria (20 June 1897) and although Conduit Square is full of townsfolk the lamps can clearly be seen affixed to the obelisk but another point to note is that the triangular enclosure adjoining the obelisk had yet to be constructed. showing the oblelisk with it's new gas lamps. In 1898 the triangular space (which still exists today) with ornamental railings, a playing fountain, grass, shrubs, two gas lamp posts and two flower pots were created as a memorial garden, to mark Victoria's Jubilee. A further tablet was put on the south face of the base to mark this event but was later removed following the placing of the war memorial in May 1926. From existing postcard photographs it can be seen that the plaque's inscription consisted of five lines of text but the exact content of the inscription cannot be determined. A fountain was created as the centrepiece issuing out of a small rockery. The whole surrounded by low railings, two lamps and flower pots were also placed at that time, effectively creating a small memorial garden. Almost as soon as the memorial enclosure and fountain was opened, complaints started to regularly appear in the local press. The feeling was that the subscribers' money would have been better spent on a drinking trough for animals and that the fountain was a continual waste of water. Prone to leaks the fountain spent much of its time switched off and when it was active it was usually restricted to the hours of 2pm to 5pm. 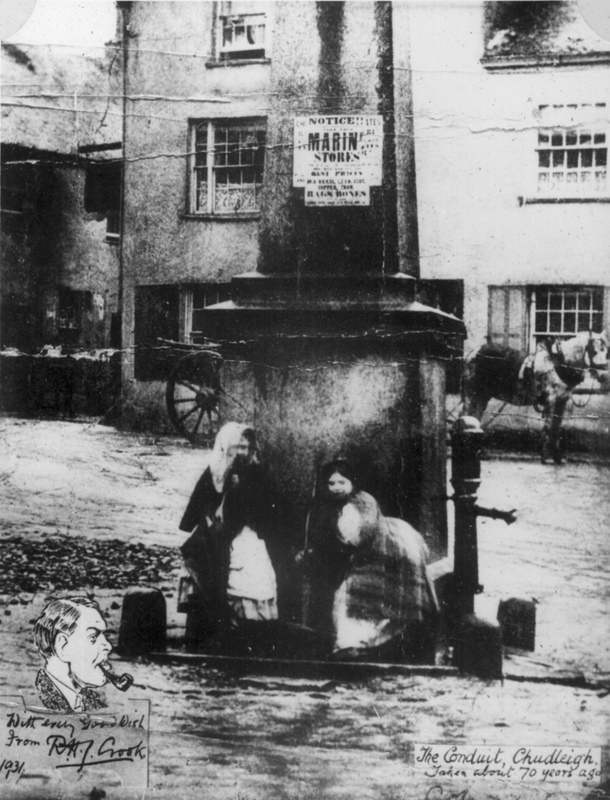 By the early 1900s the townsfolk had become annoyed with the fountain describing it in one newspaper item as 'feeble' and that a water supply for animals would be of much more use. Some even referred to the rockery as a tomb and wondered who or what was buried beneath. Postcard photographs (c1907) show the water taps for the hard and soft water supplies. The course of the water, originally via an open leat to the conduit followed a twisting route from Kennel Spring some three miles to the north of the town near Oxencombe Farm. Postcards dating to 1912 show various bill posters affixed to the base of the obelisk creating a very untidy appearance and more evidence that the enclosure was not highly thought of nor particularly cared for. In the summer of 1917 Mrs. Oldham (of Oakfield, Exeter Road) approached the parish council for permission to place two benches within the enclosure for the benefit of recuperating soldiers from the VAD Hospital at 11 Fore Street (now Alpha House), permission was granted. In the summer of 1919 the Devon General Omnibus Company was formed. With a three bus fleet 'Route 1' was Exeter–Haldon–Chudleigh–Kingsteignton–Newton Abbot. The bus stop was adjacent to the memorial triangle. At the annual parish meeting of April 1922 it was decided that the triangle enclosure should be done away with. The railings, the fountain and rockery were subsequently removed. From the Weekly Express of January 1926: '...inasmuch as it [the triangle] was the meeting-place of all classes, and also the stopping-place of the motor buses'. It was also mentioned that 'it was formerly a memorial, but had been allowed to become a dumping-ground for dead cats and rats, tins and other rubbish, and at present was used very much as a playground for children'. Items concerning the obelisk gleaned from items in the Devon Weekly Express concerning the erection of a war memorial in Chudleigh. The memorial was first mooted in 1919 but not unveiled until 9 May 1926 at a cost of £150. Before voting it was pointed out that The Square would be a most unsuitable place, inasmuch as it was the meeting-place of all classes, and also the stopping-place of the motor buses. It was also mentioned that it was formerly a memorial, but had been allowed to be a dumping-ground for dead cats and rats, tins, and other rubbish, and at present was used very much as a playground for children. There is a suggestion to place it [the War Memorial] in The Square, and if this is decided on let us hope that it will be looked after far better than a previous memorial placed there. From an artistic point of view you can hardly have a more unsuitable place, for the memorial will be overshadowed by the massive granite obelisk at present there, about which no information can be obtained why it was erected. By itself the proposed cross would have looked alright, but placed beside a huge granite obelisk it will look all wrong. [The War Memorial] is now erected in The Square. It will be conceded that the spot is not altogether an ideal one, owing to the huge granite obelisk which overshadows it and the ugly electric pole in close proximity. The two 'cups' at the entrance also take off a portion of the view, but these could easily be removed at a later period. "Late C18/early C19, Conduit Square. Granite obelisk raised on a tall rectangular base and moulded plinth. 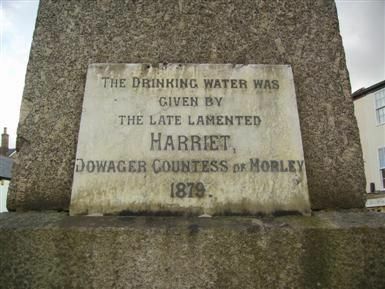 A later marble plaque fixed to the obelisk refers to the provision of drinking water in 1879. It has been suggested that the obelisk, of Haytor granite was erected to mark the completion of London Bridge (1825) built of the same stone." The following reference is also given – Bannister, G W. Chudleigh Obelisk DCNQ Vol. 20 1938-39 pp38-39. DCNQ refers to the Devon & Cornwall Notes & Queries, volumes of which are held at the Westcountry Studies Library, Exeter. G W Bannister (a Chudleigh resident) suggests the London Bridge theory but there appears to have been no evidence of a subsequent reply to his request for further information or confirmation that his theory was reasonable. London Bridge was opened in 1825 and its western side was constructed using 'Devonshire Haytor' granite. (This is the London Bridge now at Lake Havasu, Arizona). Following all this fragmentary research the conclusion arrived at was that the donor of the obelisk was in fact Mr John Williams (see The Chudleigh Book 2009). He did many good works in the town giving a great deal of financial support and it may be that his donation was made anonymously to avoid bringing undue attention on himself. The erection date would be around 1835 and was built for function rather than to commemorate anything in particular. Bench Marks (BMs) are survey marks made by Ordnance Survey to record height above Ordnance Datum. If the exact height of one BM is known then the exact height of the next can be found by measuring the difference in heights, through a process of spirit levelling. Most commonly, the BMs are found on buildings or other semi-permanent features. Bench marks are the visible manefestation of Ordnance Datum Newlyn (ODN), which is the national height system for mainland Great Britain and forms the reference frame for heights above mean sea level. ODN is realised on the ground by a network of approximately 190 fundamental bench marks (FBMs). From these FBMs tens of thousands of lower-order BMs were established.